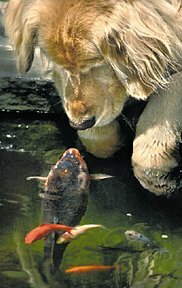 In May 2001, the Medford (OR) Mail Tribune reported on an unlikely friendship between a fish and a dog. This is the story of a fish named Falstaff and Chino, the dog who loved him. The two met three years ago, when Chino’s owners, Dan and Mary Heath, traded Portland for Medford and a house with a backyard pond. Falstaff, a 15-inch orange-and-black koi, lived in the pond. Chino, a 9-year-old golden retriever, did not. But every day, Chino would pad out to the pond and peer into the water, waiting for Falstaff to appear. Falstaff would swim to the surface, offering what seemed like a finny greeting. Together, the inter-species pals forged a strong bond. The fascination continued when the Heaths moved to a new house and built a new pond. The fancy 2,200-gallon digs made a perfect home for Falstaff — and a perfect perch for Chino. Today, the dog spends up to half an hour at a time following the movements of Falstaff and a small school of goldfish. Belly flat, paws wet, nose an inch from the water, Chino watches intently as the fish swim close enough to touch. “Falstaff comes up sometimes and will nibble on Chino’s paws,” Mary Heath says. In cynical moments, she figures the fish is motivated by the food pellets that usually accompany Chino’s visits. At other times, she’s convinced the koi shares Chino’s sentiments. But neither she nor her husband, a Realtor, is quite sure what attracts Chino, who has shown an affinity for other fish, including those in the large tank at his veterinarian’s office. As much as I believe animals possess profound intelligence, I don’t quite extend this to fish. By all reports, fish are pretty dumb. Still, it seems to me there’s probably some glimmer of an emotional response from Falstaff here. But that could simply be wishful thinking on my part. There are 2 reader responses to "Here’s Looking at You, Fish". Certainly some are pretty dumb, but there are so many kinds of fish that it’s not so surprising that a few will be smart!